Italian beader, Sara Spoltore rose to the challenge of making a beaded ankh pendant using cRAW (cubic right angle weave). She shared the information on how to construct one. She assumes you have learned the cRAW so these instructions are not for the beginner. She gives the number of beads for each "side" including the rounded portion at the top. She uses both 15/0 and 11/0 seed beads for the straight sides but had to omit the smaller beads for the curved portion. The basic design results in an open structure. What is clever is how this designer connects the inner corners to create the ankh shape. New stitch to you? Cheri Carlson for Art Beads has a great mini tutorial which teaches how to do the cRAW. It is a pain tricky to start but once you get it, it will become obvious. 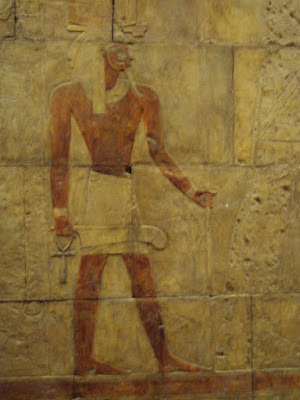 The ankh is known as the Egyptian cross. But it is actually an ancient Egyptian hieroglyphic meaning "life". The Egyptian gods were often shown carrying the ankh by the loop at the top or holding one in each hand with the arms crossed on the chest. The Coptic Christians sometimes use the ankh, depicted as a circle on top of a cross, which is then known as the Coptic ankh or crux ansata (Latin for cross with a handle).